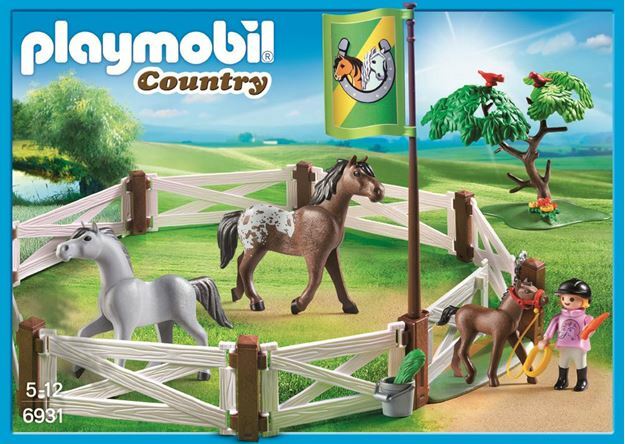 The horses and foal can play freely inside the Playmobil Horse Paddock, getting their daily exercise. When it comes time for feeding use the bucket full of grass to feed the horses. If the weather becomes too hot let the horses take cover under the tree. Includes: 3 horses, a child figure, 7 fences, a lockable gate and accessories. Part of the Country and Pony range. Age 4+ years. Distributed in New Zealand by Holdson.